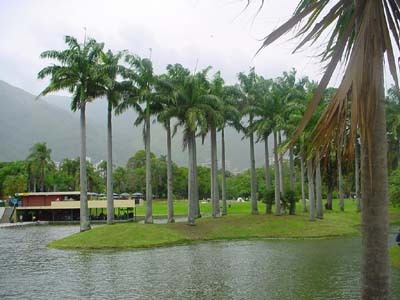 Caracas is contained entirely within a valley of the Venezuelan central range, and separated from the Caribbean coast by a roughly 15 km expanse of El Ávila National Park. (This group of mountains is greatly appreciated by the natives of Caracas for its beauty and wealth, and for being a place for natural recreation.) The valley is relatively small and quite irregular, the altitude with respect to sea level varies from between 870 and 1,043 meters (2,854–3,422 ft), with 900 meters (2,953 ft) in the historic zone. This, along with the rapid population growth, has profoundly influenced the urban development of the city. The most elevated point of the Capital District, wherein the city is located, is the Pico El Ávila, which rises to 2,159 meters (7,083 ft). The main body of water in Caracas is the Guaire river, which flows across the city and empties into the Tuy river, which is also fed by the El Valle and San Pedro rivers, in addition to numerous streams which descend from El Ávila. The La Mariposa and Camatagua reservoirs provide water to the city. The climate of Caracas is intertropical, with precipitation that varies between 900 and 1,300 millimeters (35–51 in) (annual), in the city proper, and up to 2,000 millimeters (79 in) in some parts of the Mountain range. The annual average temperature is approximately of 22.5 °C (73 °F), with the average of the coldest month (January) 22 °C (72 °F) and the average of the warmest month (May) 24 °C (75 °F), which gives little annual thermal amplitude, of 3°C. The daily thermal amplitude is greater (more than 10°C/50°F), superior to 30 °C (86 °F), that rare times descend to less from 25 °C (77 °F). In the months of December and January abundant fog may appear, in addition to a sudden nightly drop in temperature, until reaching 13 °C (55 °F) or less, this peculiar weather is known by the natives of Caracas as the Pacheco. In addition, nightly temperatures at any time of the year usually do not remain above 20 °C (68 °F), which results in very pleasant evening temperatures. Hail storms appear in Caracas, although only on rare occasions. Electrical storms are much more frequent, especially between June and October, due to the city being in a closed valley and the orographic action of Cerro El Ávila. The population of Caracas is of 5,452,320 (2007) inhabitants, not including the surrounding suburbs, like Petare, whose population is approximately 1,500,000 people. The mixture of races and cultures has marked this city throughout its history. Previously, during colonial times, Spaniards mixed with local native Indians and again with African slaves brought to work on the cocoa and coffee fields. As a result, the racial and ethnic composition of Caracas is diverse. After independence and following the discovery and exploitation of petroleum, European immigrants began to arrive in the growing city. Examples include the French, who brought the telephone system (thus, locals answer the phone in French style, saying "aló", and the Dutch (Shell Petroleum), who came to exploit the natural resources. The aftermath of the Second World War, repressive European dictatorships, and the continued exploitation of petroleum attracted many thousands of immigrants from Spain (Galicia, Canary Islands especially), Portugal (Madeira Island especially), and Italy. Middle Eastern immigrants from Palestine and Lebanon also sought a new life in the city.European immigration was notorious during the 1960s and 1970s, but the 1980s and 1990s saw growing numbers of immigrants hailing from neighbouring countries such as Colombia; Ecuador; Peru, Bolivia, Trinidad and Tobago, and Haiti. Due to the old Spanish influence, mixture of races and cultures has been an accepted part of life in the city of Caracas. Therefore, it is not difficult to find blond people with dark eyes, as well as very dark people with blondish hair and blue eyes. Nevertheless, the common demography would be "mulatos" (people of mixed black and white ancestry), "mestizos" (mixed white and native Indian), and "criollos" (an amalgamation of three races). Many newcomers from the countryside have arrived, but unfortunately the city has grown haphazardly. No demographic planning has ever been carried out, thus there are entire districts and neighbourhoods of Caracas lacking water and electrical systems, not to mention other services like schools, hospitals, police, fire departments, etc. Therefore, some suburbs and districts of the city are like lawless territories, in which insecurity is felt at all times. Caracas, like many other Latin American cities, represents the best example of "non-planned supportable development", where a modern, progressive city coexists with lawlessness and poverty.